Kim has redefined the development bank’s mission and overhauled its management ranks to make it more responsive and results-oriented. Now it’s time to deliver. It’s a Monday morning in early August, and nearly 50 heads of state have descended on Washington for the first-ever U.S.-Africa Leaders Summit. 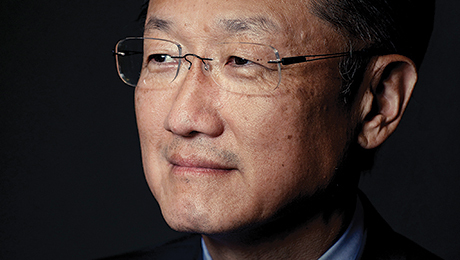 For World Bank president Jim Yong Kim, that means a whirlwind agenda. African countries are among the most important clients of the development bank as it seeks to fulfill its goal of ending global poverty, and Kim is determined to meet with as many presidents, prime ministers and other senior officials as he can. He’s also agreed to explain to me what the “science of delivery” is and why it holds the key to the Bank’s future. Kicking off a meeting at World Bank headquarters with ministers from more than three dozen African countries, Kim says the Bank stands ready to finance infrastructure projects and promote regional trade initiatives to foster growth on the continent. After 30 minutes he ducks out, and his aides whisk me down to the Bank’s basement parking garage, where I rejoin Kim in his black GMC Denali — that conspicuous vehicle that signals “Washington VIP.” On the crosstown drive to an African energy conference sponsored by the Economist and General Electric Co., Kim explains his optimism about the Bank’s future. Yes, private capital flows swamp the Bank’s resources, and the BRICS nations have agreed to launch a development bank that could be a potent rival to his institution, but countries — including such growing powers as China and India — remain eager to work with the World Bank because of the breadth of its global experience. Two weeks earlier, he recalls, Prime Minister Narendra Modi told him at a meeting in New Delhi that he wanted the World Bank to be his “information bank,” helping India to extend education and improve the skills and productivity of its workforce. After arriving at Washington’s Newseum, Kim works the GE event briskly. Joining a panel session on power, he speaks passionately about the need to extend electricity to the 600 million Africans who now live off the grid, calling the continent’s meager generating capacity a crime. He gives shout-outs to some of the power brokers at the event, including Nigerian Finance Minister Ngozi Okonjo-Iweala (one former rival for the Bank presidency) and Ashish Thakkar, founder and CEO of pan-Africa conglomerate Mara Group. He sits for a television interview to outline the Bank’s lending priorities in Africa. Then it’s back into the Denali for the ride back to World Bank headquarters, and without prompting or skipping a beat, Kim picks up our previous conversation right where we left off one hour earlier. It’s not surprising that Kim stresses on-the-ground know-how. As a Harvard-educated MD with a Ph.D. in anthropology, he has plenty of smarts. He spent more than two decades launching innovative health care projects from Peru to Rwanda. What is surprising is that he’s leading the World Bank. Since its establishment in 1944 as a bedrock of the postwar Bretton Woods financial system, the development lender had known only bankers, business executives and politicians for bosses. And Kim was not exactly a fan. Today, Kim is trying to lead a revolution from the inside. 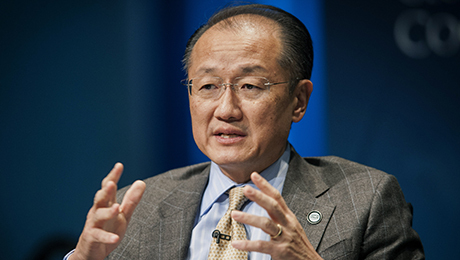 Since taking over the leadership of the World Bank in July 2012 following his surprise nomination by President Barack Obama, he has redefined the organization’s mission in simple but stark terms: ending extreme poverty by 2030 and promoting shared prosperity by lifting the incomes of the bottom 40 percent of the population. To achieve those ends, Kim has over the past year carried out the biggest reorganization of the Bank’s sprawling bureaucracy in nearly 20 years, taking a sharp knife to costs and appointing a cadre of senior executives to head up 15 new global practices in areas such as education, the environment and natural resources, and finance and markets. He’s also staked out a big role for the World Bank in efforts to combat climate change, arguing that unchecked increases in global temperatures would hit the poor hardest. The new structure and goals, he insists, will sharpen the Bank’s ability to distill the best development lessons from around the world and deliver that knowledge — and money — to developing countries. For Kim this is the World Bank’s Piketty moment. French economist Thomas Piketty, whom Kim loves to quote, has put a global spotlight on inequality with his bestselling book, Capital in the Twenty-First Century. To seize the moment, Kim says, the World Bank must show it can deliver practical solutions — from building roads and power plants to overhauling social welfare and educational systems — that will help poor countries become more prosperous. CAN KIM’S BANK RISE TO THE CHALLENGE? No one doubts his passion and commitment, but skeptics both inside and outside the Bank question his methods. Consider the reorganization. The idea of bringing the best global knowledge to bear on particular countries’ development problems is not exactly new. Previous presidents have cited the same goal — in fact, it’s practically the raison d’être of the world’s largest development agency, with a presence in more countries than any other and an annual budget of more than $60 billion. It remains to be seen whether Kim’s global practices will provide better service to member countries than previous setups did. In 1987 then-president Barber Conable Jr. reorganized the Bank along sector lines such as transportation and power. A decade later James Wolfensohn tore up the org chart, sending hundreds of staff from headquarters out into the field and empowering country directors as his praetorian guard, all in the name of making the Bank more responsive to its clients. Kim’s reorganization dealt a blow to staff morale and prompted the departures of a number of senior executives, including managing director Caroline Anstey and head of change management Pamela Cox. Kim brought in consultants from McKinsey & Co. to advise on the restructuring and made four dozen senior executives apply for new jobs as part of the almost yearlong process. The staff association complained about a lack of consultation over the changes, and African members of the board of governors criticized the absence of African appointees among the new global practices heads. To be sure, any reshuffling of an organization as sprawling as the World Bank, with its 15,000 highly educated and well-compensated staff, was bound to stir up trouble. Wolfensohn’s changes generated howls of complaints and disrupted the Bank’s activities for a year, but most World Bankers look back on his tenure, from 1995 to 2005, as arguably the institution’s high point for elevating the problems of corruption, pushing for debt reduction and reaching out to nongovernmental organizations. Kim told his board to expect some “noise,” as he puts it, about the changes, and he points out that the Bank managed to increase its volume of lending, equity investments and investment guarantees by nearly 16 percent in the financial year ended June 30, to $61 billion. So far, the board remains supportive. “If there was no criticism, there was no change,” says Frank Heemskerk, the Dutch executive director of the Bank. Yet the recent turmoil comes at a time when the Bank faces some of the biggest challenges in its 70-year history. Poverty may remain deeply entrenched in many areas, but some of the Bank’s biggest traditional customers — such as Brazil, China, India and Indonesia — have built up massive reserves and can borrow freely on international markets. The Institute of International Finance projects that private capital flows to emerging-markets economies will hit $1.03 trillion this year and $1.11 trillion in 2015. The Bank “is struggling to maintain its relevance in a world where many of its former clients have acquired the resources and the wealth to shift away from World Bank lending,” says Eswar Prasad, an economist at Cornell University. So great is the recent shift in economic power that several of those clients are looking to compete with the World Bank in the development business. At a July summit meeting in Fortaleza, Brazil, the leaders of Brazil, Russia, India, China and South Africa agreed to create the New Development Bank, with initial capital of $50 billion, and extended an open invitation to other emerging-markets countries to join. The initiative, which also includes the creation of a $100 billion reserve swap facility that members can tap in a crisis, represents the first major attempt to redraw the international financial system for the 21st century and break away from the dominance of Western-led institutions like the World Bank and the IMF. China has bigger ambitions still, seeking to drum up support for a new Asian infrastructure investment bank, which would be largely under Beijing’s control. “The BRICS are gaining political weight and demonstrating their role in the international arena,” Brazilian President Dilma Rousseff said after the bloc’s summit meeting. As if that weren’t enough, the Bank is being pulled in multiple directions, and Kim will struggle to keep those tensions in check. His development background and the Bank’s poverty goal suggest a greater commitment to the world’s poorest countries, but Kim also wants to increase lending to middle-income countries like China and India because earnings on those loans keep the World Bank afloat. Although Kim has also promised to ramp up the Bank’s work on big infrastructure projects, environmental groups worry that such efforts will clash with another Kim goal: putting the fight against climate change at the heart of his institution’s activities. Kim acknowledges the challenges but insists the Bank is more than prepared to meet them. The rise in lending last year suggests that the organization remains relevant to developing countries, he says. He considers the new BRICS bank more of a potential partner than a rival and promises to work closely with it to address the world’s massive infrastructure needs. China may have lifted 500 million people out of poverty with its astonishing growth rate over the past 30 years, but it still has nearly 100 million people living on less than $1 a day. The World Bank made $1.65 billion in fresh loan commitments in China last year, and its private sector arm, the International Finance Corp., made $1.64 billion in investment commitments in the country. (It doesn’t hurt that the IFC’s CEO, Jin-Yong Cai, is a Chinese national.) The Bank sees a big role to play in China’s transition from an export-driven economy to a consumer-led one. The China 2030 report, a 470-page blueprint for the transition, published jointly in 2012 by the Bank and the Development Research Center of the State Council, Beijing’s cabinet, was the signature achievement of Kim’s predecessor Robert Zoellick. In July, Kim met with President Xi Jinping and Premier Li Keqiang in Beijing and agreed to carry out a yearlong study of, and propose reforms for, China’s health care system. “This is a huge vote of confidence in our knowledge work,” Kim says. Notwithstanding its strong growth over the past decade, India is still home to more of the world’s poor — some 400 million — than any other country. It’s also the World Bank’s biggest area of operations. The Bank extended $5.2 billion in loan commitments in the year ended June 30, and the IFC chipped in a further $1.14 billion in investments. On a visit to India in July, Kim said the Bank was ready to provide as much as $18 billion in financing over the next three years. Kim believes he met a kindred spirit in Modi. The prime minister swept to power in May on the basis of his record of pragmatic, can-do leadership in the state of Gujarat, in western India, where he improved power and transportation networks, and fostered a dynamic business climate. He wants the World Bank to help his government revive public-private partnerships. The previous government wanted PPPs to attract half of the country’s projected $1 trillion in infrastructure investment between 2012 and 2017, but results have fallen well short of that goal so far. Kim isn’t cutting himself any slack. He says he needs to demonstrate within a year that his reorganized Bank can better meet the needs of developing countries than it has in the past. Member governments will be watching closely to see if he delivers. “This is going to be the big test for Jim Kim and his leadership,” says Rogerio Studart, the Bank’s Brazilian executive director. HOW KIM FARES ON THAT TEST could be decisive for continued American sway over the Bank. Under an informal agreement dating from the end of World War II, the U.S. has appointed every World Bank president and the Europeans name the managing director of the IMF. Western economic dominance has long since faded, though, and emerging-markets nations, which now account for more than half of global output, increasingly chafe at their limited influence over the Bank’s board and policies. In 2010 the organization awarded a third board seat to sub-Saharan African countries, and in recent years it has increased developing countries’ stake in the Bank by 4.6 points, to 47.2 percent, but the U.S. remains the only country with effective veto power, and European countries hold eight of the 25 seats on the board of directors. Kim is the first World Bank president to face formal opposition for the job. Under new procedures adopted as part of the Bank’s governance reforms, Nigeria nominated Okonjo-Iweala for the post and Colombia put forward former Finance minister José Antonio Ocampo. Although many believed the Nigerian to be the best candidate, based on her experience in driving reform at home and a four-year stint as the Bank’s managing director and Zoellick’s No. 2, the board of directors endorsed Kim for the job thanks to the solid backing of Washington and its allies. If Kim’s reforms fail, Washington could lose its grip on the Bank when it’s time for the next succession, observers say. “The U.S. and Europe aren’t unbeatable,” says Lant Pritchett, a former Bank veteran who cochairs the master in public administration/international development program at Harvard University’s John F. Kennedy School of Government. Kim was a surprise pick for the U.S. nomination. Lawrence Summers, a former Treasury secretary and head of Obama’s National Economic Council, lobbied vigorously for the job behind the scenes, insiders say, while Jeffrey Sachs, the development expert who runs the Earth Institute at Columbia University, campaigned for it publicly. Just days before the deadline for nominations in March 2012, Kim got a call from then–Treasury secretary Timothy Geithner. He recalled the exchange in a conversation with Carlyle Group’s David Rubenstein at the Economic Club of Washington last year: Kim was serving as president of Dartmouth College, and he presumed that Geithner, a Dartmouth alumnus, was calling to recommend someone for admission. Instead, Geithner asked if Kim would consider the Bank presidency. “And I just was shocked,” he recounted. “I said, ‘You mean the World Bank?’” He flew to Washington the next day to meet with Obama, and three days later he was standing by the president’s side at the Rose Garden announcement ceremony. Many development experts were just as shocked as Kim. The Washington rumor mill had been buzzing for months, suggesting names such as then-senator John Kerry, then–United Nations ambassador Susan Rice and even Microsoft Corp. founder Bill Gates. “Why did the name never come up once?” asks Pritchett, referring to Kim. “He was never a serious player in this space.” It’s true that he didn’t have a global profile, yet Kim’s on-the-ground experience in developing countries appealed to Obama. Sources say he also got a strong push from Bill and Hillary Clinton, whose Clinton Global Initiative has worked closely with Partners in Health. 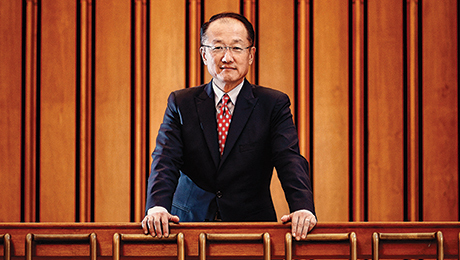 JIM KIM WAS DRIVEN TO SUCCEED. In 1964, when he was five, his family left a then–desperately poor South Korea to come to the U.S. His father, a dentistry professor at the University of Iowa, had high expectations for him. Kim grew up in the Mississippi River town of Muscatine and was valedictorian of his high school class as well as quarterback of the football team and point guard on the basketball team. He likes to tell the story about the time his father drove him home from the airport after his first semester at Brown University. Kim said he wanted to study philosophy and political science so he could go into politics. His father pulled the car off the road, turned off the engine and said, “Jim, after you finish your medical residency, you can do anything you want.” His mother, who earned a philosophy Ph.D. from Iowa, introduced him to the teachings of Martin Luther King Jr. and cultivated his social conscience. After Brown, Kim was off to Harvard Medical School, where he enrolled in a pioneering dual-degree program in medicine and anthropology. The pairing was crucial: Kim says medicine instilled his evidence-based approach to solving health issues, and anthropology (he got his Ph.D. in that subject in 1993, two years after his MD) trained him to identify the social, cultural and political barriers to delivering health care. The program also led him to form a defining friendship with a fellow student, Paul Farmer. Farmer took Kim to Haiti, where he had been volunteering in health clinics, and in 1987 — while still in med school — the two co-founded Partners in Health. The nonprofit teams with local outfits to set up clinics and hospitals, with an emphasis on combating difficult diseases like HIV-AIDS, malaria and tuberculosis. At a clinic in Carabayllo, a slum on the outskirts of Lima, Peru, Kim and Farmer pioneered a new method of treating multi-drug-resistant TB with a cocktail of drugs, initially packing their briefcases with drugs from Harvard’s Brigham and Women’s Hospital and later cajoling pharmaceuticals companies to provide them at lower cost. Both Farmer and Kim won so-called genius grants from the John D. and Catherine T. MacArthur Foundation for their work at Partners in Health, which today has operations in seven overseas countries and helps run a community health service program for the Navajo nation in the American Southwest. In 2003, Kim became director of the World Health Organization’s HIV-AIDS department, where he launched the 3 by 5 initiative, which aimed to put 3 million HIV-AIDS sufferers in developing countries on antiretroviral treatment by the end of 2005. Many doubted the program could achieve the ambitious goal given the high cost of treatment, weak health care networks in many target countries and outright resistance to treatment in some areas, notably South Africa. Yet WHO reached the 3 million target in 2007, and as of 2012 the program had treated 7 million Africans with HIV. Kim left WHO to chair the department of global health and social medicine at Harvard Medical School in 2006, then in 2009 he was named president of Dartmouth College, becoming the first Asian-American head of an Ivy League school. Kim has brought his taste for targets to the World Bank, persuading the board last year to declare the organization’s mission as ending extreme poverty by 2030 and promoting shared prosperity. The Bank defines the first goal as reducing the number of people living on less than $1.25 a day to no more than 3 percent of the world’s population, compared with nearly 18 percent, or 1.2 billion people, in 2010. The Bank has struggled to define the second goal but aims to promote income growth in the bottom 40 percent of countries’ populations. Some development experts dismiss the goals as largely a PR stunt, noting that the Bank has been in the poverty-fighting business for decades. In a 1973 speech former president Robert McNamara called for ending extreme poverty by the end of the 20th century. But Kim contends that setting explicit poverty goals is essential to framing the Bank’s priorities. Columbia’s Sachs agrees. “It’s a tremendous breakthrough,” he says. Kim set a new tone at an institution that had been through considerable turmoil in the past decade. Paul Wolf­owitz alienated staff with his high-handed approach and reliance on a tight coterie of aides drawn from the Bush administration before he was forced to resign in 2007 over allegations of favoritism for arranging a big pay raise and secondment for his girlfriend, a Bank employee. Zoellick restored order and a workmanlike environment, but he never articulated a clear vision for the Bank. Kim’s reorganization has generated a fair bit of turmoil in the past year. Bringing in McKinsey consultants didn’t endear him to staff. Yet Kim’s top lieutenants appreciate his scientific, data-driven approach to looking at issues. “He did not trust any of us when he came in,” says Rachel Kyte, a vice president who serves as Kim’s special envoy on climate change. The president’s approach was “show me the data; show me the evidence,” she adds. “That was just refreshing.” In his first weeks in office, Kim was briefed on a climate change study under way at the Bank. He sat down with the scientists, immersed himself in the topic and became convinced of the need for the Bank to take action, Kyte says. His method was instructive, she recalls: “What is the outcome we want to achieve?” he asked, then, “What are the policies that will get us there?” In November 2012 the Bank issued a report titled “Turn Down the Heat” that called for action to prevent a 4-degree-Celsius rise in average global temperatures by the end of this century, and Kim has been outspoken on the issue ever since. By creating the new global practices, Kim is hoping to foster greater collaboration inside the Bank. He is also seeking to get greater cooperation among the organization’s four arms: the International Bank for Reconstruction and Development (IBRD), its main lending vehicle for middle-income countries; the International Development Association (IDA), which provides grants and concessional loans to the world’s poorest countries; the IFC, which invests in the private sector; and the Multilateral Investment Guarantee Agency, which offers credit enhancement and risk insurance to private investors. When Pedro Alba, vice president for budget, strategic planning and performance review, served as country head of Argentina, from 2007 to 2010, the Bank carried out a road safety program there. After he moved to Moscow to head the Bank’s Russia operations, Alba saw an opportunity to improve road safety there, but he found it very hard to draw on his former colleagues in Argentina; he needed to persuade their country bosses to release them, and he had to tap his own budget to pay them. “There was a lot of reluctance in Latin America to release people,” he explains. 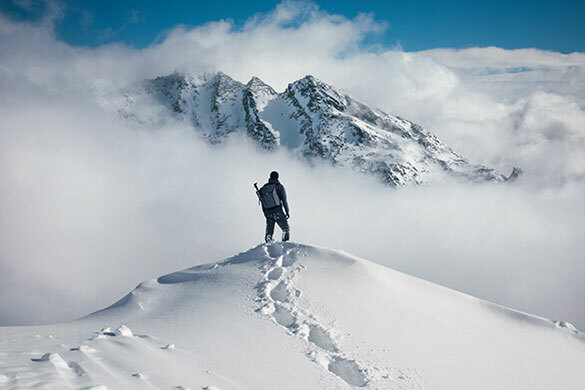 Under the new global practices, staff are paid from a central budget and incentives have been put in place to encourage managers to draw on expertise from around the organization, says Keith Hansen, one of two vice presidents in charge of global practices. The new arrangements and many of the global practices heads have only been in place since July, and it remains to be seen if the new setup will work as planned. “The ultimate test is whether our clients see a difference,” Hansen says. One positive sign is the elevation last year of Sri Mulyani Indrawati as chief operating officer. Indrawati came to the Bank in 2010 from Indonesia, where she served as Finance minister. She has personal experience of the need for responsiveness, having worked with the Bank in its role as global coordinator after the 2006 earthquake and tsunami devastated Indonesia’s Aceh province, and having taken the Bank’s advice on the best way to sequence her program of economic reforms, including reductions in fuel subsidies and the use of conditional cash transfers and block grants to improve education and health care. The reorganization is delivering on the cost front. The Bank has achieved half of a targeted $400 million in annual cost savings by cutting back on travel spending, abolishing parking subsidies for staff and slowing recruiting, says CFO Bertrand Badré. The Bank will also cut an unspecified number of positions this year to reach its goal. “What we did in finance is to remind people this is a bank,” Badré says. “You have costs and retained earnings. If you want to grow capacity, you have to retain earnings. You have to work on costs.” The CFO sees potential for the Bank to do more of the latter through offshoring. It employs more than 500 people in Chennai, India, to support central functions such as accounting, information technology and treasury. “I think we can do more in that area,” says Badré, who points out that his previous employer, Société Générale, employs more than 4,000 staff in India. The cost cuts will allow the IBRD to boost annual lending to as much as $28 billion, compared with $18.2 billion in the financial year ended June 30, Badré says. To keep that in perspective, though, such growth would merely restore IBRD lending to the levels that prevailed in the 1980s and ’90s. Most of the Bank’s growth in recent years has come at the IDA and the IFC. The latter accounted for nearly 28 percent of the group’s total commitments in the latest year, up from just 13 percent in 2000. IF THERE IS ONE AREA ON WHICH Kim will be judged, it’s likely to be infrastructure. Developing Africa’s power-generation and distribution network would probably have the single greatest impact in reducing poverty on the continent, Bank officials say. Infrastructure will also play a key role in maintaining the Bank’s relevance in middle-income countries and preventing it from being eclipsed by the BRICS bank. The Bank devoted some $23 billion in lending and investments to infrastructure in the year ended June 30, up from $17 billion the previous year, but that represents a drop in the bucket of global needs. Sub-­Saharan Africa alone needs $100 billion a year invested in new roads, rail, power networks and the like, the Bank estimates; worldwide the annual need is a cool $1 trillion. The World Bank can’t raise its direct infrastructure spending anywhere near enough to make a big difference. Instead, Kim is seeking to create a global infrastructure facility that will catalyze far greater amounts from global investors, ranging from sovereign wealth funds like Singapore’s Temasek Holdings to pension funds like Canada Pension Plan Investment Board and institutional managers such as BlackRock. CFO Badré has been leading efforts to develop such a facility. The idea is for the Bank to work with governments and other partners to identify priority projects, draw up plans, move ahead on the regulatory and environmental approval processes, and then reach out to big investors by offering pieces of the action. 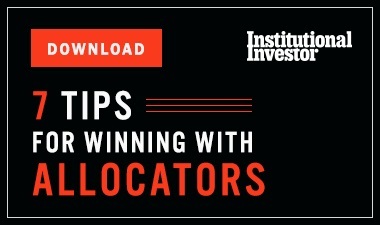 By removing a lot of the uncertainty and hassle from projects and identifying a clear role for outside investors, Kim believes, the facility can unlock an influx of capital from investors eager to find good long-term investments. “We want to find ways to attract in a serious manner private money into infrastructure,” he says. Some NGOs worry that the fresh push on infrastructure will come at the expense of the environment and local populations. They point to proposed revisions to the Bank’s environmental and social safeguards, which the institution put out for comment in July. Under the proposal the Bank could lend to infrastructure projects based on environmental and social impact assessments made by the borrower countries rather than by the Bank itself. Activists fear that the proposal, if adopted, could give governments a green light to force the resettlement of local populations to make way for dams and other big projects, and fail to provide those affected with adequate compensation. Such a change would represent “a massive dilution and undermining of the safeguards,” says Susanne Breitkopf, senior policy adviser on climate change and forests at Greenpeace International in Washington. Kim makes no apologies for his Africa comments. He emphasizes that the Bank has to be pragmatic about the continent’s needs and can’t rule out coal, which is abundant in Mozambique and other countries. He also faces pressure from countries, notably India, that have fast-growing power needs they say ensure a continued need for coal. Officials insist the Bank isn’t giving short shrift to climate change. It is looking to increase its financing of solar, wind and other alternative-energy sources. Kim frequently makes positive mention of the proposed Grand Inga Dam, on the Congo River in the Democratic Republic of the Congo, which has the potential to generate twice the power of China’s Three Gorges Dam. Climate change envoy Kyte says prospects for renewable energy will be a major theme of Vietnam 2035, a development plan akin to the China 2030 report that the Bank is currently working on with Hanoi. “Without his strong position on climate change, I don’t think it would be possible for us to be in the position we are in,” she says. Any discussion of infrastructure inevitably comes back to the BRICS. These countries account for a big share of the global demand for infrastructure, and with the creation of the New Development Bank, they showed they are determined to spend a lot of their own money to meet that demand. Does Kim fear competition? Not to hear him talk. There’s more than enough development work — on infrastructure and other projects — to be done and not enough money, he says, so the World Bank stands ready and eager to share its experience and cooperate on projects with the BRICS bank when it becomes operational. Kim has even tasked the Bank’s incoming China head, Bert Hofman, with advising Chinese officials as they consider whether and how to go ahead with an Asian infrastructure bank. AS WE CRISSCROSS WASHINGTOn in the black Denali, Kim recalls a story Prime Minister Modi told him on his India trip. Modi took over as chief minister of Gujarat in 2001, when the state was reeling from a devastating earthquake in January of that year that killed some 20,000 people and destroyed about 400,000 homes. Modi’s first move was to reopen schools in the affected areas. That simple step, he told Kim, started restoring a climate of normalcy that got people moving to clean up and rebuild from the quake.